To prepare the vegetables: Slice the peas in half lengthwise (or just roughly chop them). Slice the carrots into thin, small, bite size pieces or peel with a vegetable peeler. Bring two big pots of water to a boil. In the meantime, toast the sesame seeds: Pour the sesame seeds into a small pan. Toast for about 4 to 5 minutes over medium-low heat, shaking the pan frequently to prevent burning, until the seeds are turning golden and starting to make popping noises. Once the pots of water are boiling: In one pot, cook the soba noodles just until al dente, according to package directions (probably about 5 minutes), then drain and briefly rinse under cool water. Cook the frozen edamame in the other pot until warmed through (about 4 to 6 minutes) but before draining, toss the halved peas into the boiling edamame water and cook for an additional 20 seconds. Drain and set aside. To make the sauce: whisk together the ingredients in a small bowl until emulsified. Set aside. 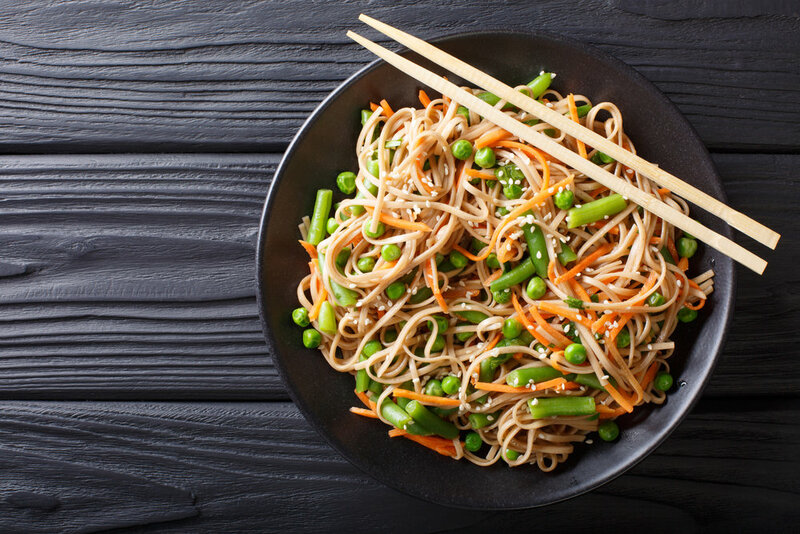 Combine the soba noodles, edamame, snap peas and carrots in a large serving bowl. Pour in the dressing and toss with salad servers. Toss in the chopped cilantro and toasted sesame seeds. Enjoy!